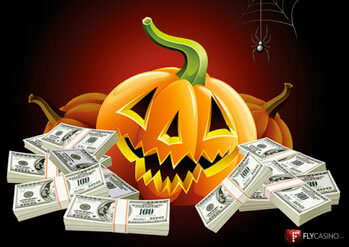 Fly Casino wants you go Pumpkin Picking for cash, bonus coupons, cashback and free play! Simply logging into Fly Casino and your gaming activity will play a part in determining the chances that you will find a Pumpkin and pick up great prize. But, like any day out in the pumpkin patch, you might not find your Pumpkin to take home. How it works: Simply come into Fly Casino daily between the 15th and 31st. Each day there is a pumpkin that can be found and a prize attached. Some days finding a pumpkin can found by simply making a deposit. Other days, you may find one just by logging in. Other days, you may find a Pumpkin by the total amount of wagers that you make or spins made at the slots. You may find the “Challenge Pumpkin” that may challenge you to complete a task for the day to win. There are many variables. If you find a pumpkin, a pop-up message will appear detailing what you have won. Please be aware that you are responsible for seeing the pop-up and reading the details of what you have won and how to claim your prize before closing the message. Some prizes are automatic, others may need to be claimed with our 24/7 online chat. There is no need to deposit and/or wager to find a pumpkin prize. However, doing so does increase the likelihood that you will. There is no guarantee that you will find a pumpkin every day, but it IS possible that you can. All pumpkin prizes have a 10X wagering requirement on slots before withdrawing. Super Value Sunday! On Sunday from 00:00GMT until 23:59 GMT, all members on their first deposit of $/£/€50 or more will receive a $/£/€80.00 deposit bonus. 160% BIG TUESDAY! From 00:00GMT until 23:59 GMT, all members are invited to receive a 160% bonus up to 160.00 on your first deposit of $/£/€ 30 or more.